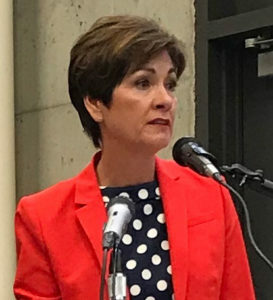 Republican Governor Kim Reynolds has released a decade’s worth of personal income tax information and is using the move to issue another challenge to Fred Hubbell, her Democratic opponent, to do the same. Hubbell has said he would do so. Reynolds issued a written statement from her campaign, saying Iowa voters deserve “full transparency.” Reynolds has provided the data from the combined income tax returns she and her husband, Kevin, have filed. In 2017, Reynolds and her husband, who retired in March of last year, earned about $162,000. Their federal tax rate was about 14 percent and their Iowa tax rate was 4.7 percent. The couple gave nearly 11 percent of their adjusted gross income to charity. In 2008, when Reynolds was still a state senator and her husband was a federal employee, working as district conservationist for the USDA. the couple earned about $115,000. They also paid about $4000 in tuition as Reynolds returned to college and the couple contributed $422 to charity in 2008. Governor Reynolds’ predecessor, Terry Branstad, publicly released his income tax returns during his first campaign for governor in 1982. Roxanne Conlin, his Democratic opponent, and her husband then released their returns, revealing the couple had not paid state income taxes in 1981 due in large part to tax shelters she had denounced. In 1998, Democrat Tom Vilsack released five years of tax returns he and his wife, Christie, had filed. During Vilsack’s 2002 campaign for a second term as governor, he called for a state law that would require candidates to release their tax records and a statement of their net worth. Democrat Chet Culver, who served one term as governor and lost a bid for reelection in 2010, also released information about the tax returns he and his wife, Mari, filed.